Currow: (Irish: An Currach / Corra - The Marsh) is close to Kerry International Airport and a perfect place to stay if you arrive at the airport late or have to fly out early. It is also perfectly placed to visit the towns of Killarney, Tralee and Dingle. 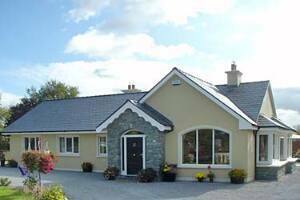 There is 1 Bed and Breakfast in Currow with rooms starting at €70 per night. Please book directly through this website to miss out the middlemen and reduce B&B Owners costs.